Harry and Ron helped Astoria and Pansy up from the ground. They were both very shocked. " Are you okay? Both of you?" Harry asked worriedly.
" I&apos;m fine" Pansy breathed. " Me too" Astoria replied.
" Harry let&apos;s take them to your place. We can&apos;t be stuck here for another minute" Ron said to Harry. " No please" Astoria said. " I have to go home. My parents expected me to be home one hour ago. They must be worried"
Harry looked at Ron and sighed. " Fine, I&apos;ll follow you home" " I&apos;m fine Harry..." Astoria said. " It was not a question" Harry took Astoria&apos;s hand and they disapparated immediatley.
" Will you follow me home too?" Pansy said with a weak smile to Ron.
" unlike Harry, I let you decide that one" Ron said. " Because I&apos;m super hungry and haven&apos;t really ate today. " " Why don&apos;t we eat something at my place and i tell you everything you need to know?" Pansy suggested. " I mean you saved my life after all"
Ron agreed first when he heard the word " eat". Harry and Astoria stood in front of Astoria&apos;s manor and Harry just had to stop a few minutes to look at it. It was huge. " And I thought Draco&apos;s manor was big" Astoria chuckled. " Well, his and mine are quite the same. We just have a bigger garden"
They walked up to the door and Astoria slowly opened it. " Harry, it would mean much if you didn&apos;t tell my parents about what happened in Knockturnalley" Harry frowned.
" Why shouldn&apos;t I...?" " Because they&apos;re both worried enough about my sister" Harry didn&apos;t want to sneak around so he decided not to ask about Daphne.
" Okay... But can you describe the men?" Astoria tried to focus on remembering, but there wasn&apos;t much she could help him with. " All I know is that I saw a pair of light blue eyes on my attacker. He was very strong and tall"
" Thank you Astoria" Harry said and smiled. " No Harry, I think it&apos;s me who should be thanking you" Before Harry had time to think, Astoria gave him a quick peck on the cheek and hurried inside and closed the door. Ron tried to not eat like a horse when he sat in the Pansy&apos;s kitchen and ate some pasta with bolognese. He asked if Pansy remembered anything special about her attacker. Just like Astoria, she didn&apos;t. Just that her attacker had dark eyes.
" Do you live here alone or what...?" Ron asked when he noticed that they had been alone together for 30 minutes. " 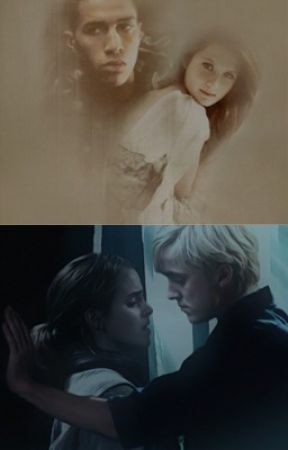 No...my parents are too busy for spending time with me so they ain&apos;t here"
Ron tried to give her a sympathetic smile but failed, but she understood that he tried. " Don&apos;t worry about it. I&apos;m fine on my own"
" Yeah so I noticed earlier" Ron mumbled. " I&apos;m not so good at spells, okay? I&apos;m better at potions and care of Magical creatures"
" I can...teach you some, if you want to" Ron said slowly. Pansy looked up at him and gave him a smile.
" That would be great"